When I did the backups I simply copied all content from programs application and data folders. When you need to find something in backed up Thunderbird or Opera profile, you can use Total Commander, hit Alt+F7 and use its content search in all files. Both Opera and Thunderbird have their data stored in text files, so you can read the e-mail content from them relatively easily. However this doesn’t apply for Outlook Express DBX files. How to open and read DBX files from Outlook Express? There are two options how to access content stored in DBX files. The first is to copy them to mail storage and access them via Outlook Express or Windows Mail again. But because I don’t use these clients more I prefer the second option – installing a special DBX files viewer. When you do some googling, you will find many viewers able to open the DBX files. But I would like to recommend the MiTeC Mail Viewer. It is a small application without need to install. Just download the ZIP file, unpack the one executable and run it. MiTeC Mail Viewer is able to open data files backed up from Outlook Express, Windows Mail, Windows Live Mail and from Mozilla Thunderbird. So it is able to work with DBX files too. Click the File | Open menu, select the appropriate mail client and browse for the database file. Then click the OK button. The app will open with a grid including all your mails founded in the DBX or other file. Click the columns headers to perform the sorting. Double click the selected message to open its content in a new window. MiTeC Mail Viewer is very fast, free, simple and portable e-mail data file reader able to work with DBX files and other formats. 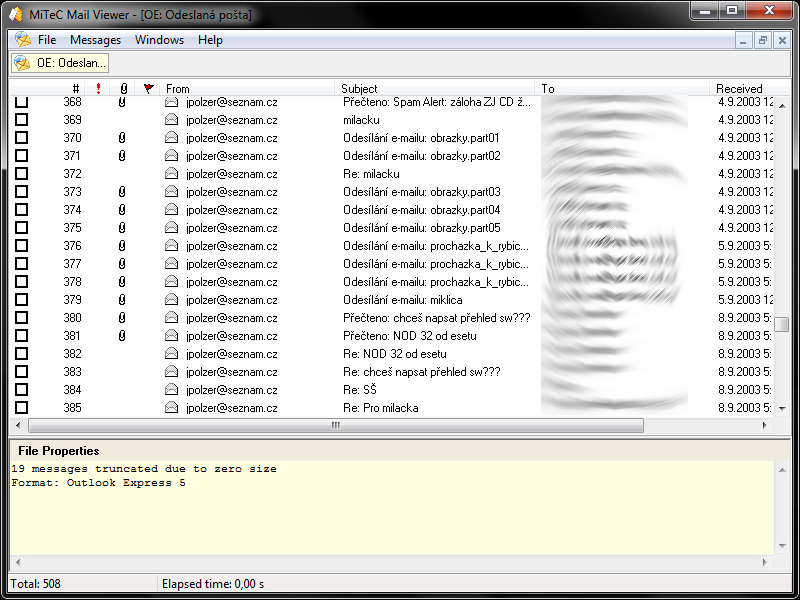 It allows you to read the messages like using the common mail client, including the option to open the attachments. Give it a try.